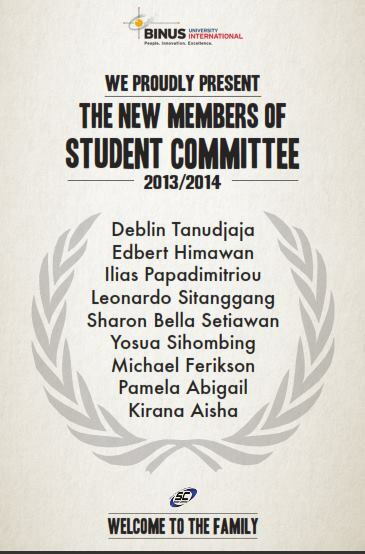 BINUS INTERNATIONAL Student Committee (STUCOMM) held a committee management succession event on Friday, December 13, 2013. The succession followed a vote for the members of the board of the Student Committee (STUCOMM) who will sit for the 2014/2015 period. The event, held at The Joseph Wibowo Center campus lobby, was attended by all members of the board of STUCOMM, several members of SAR and faculty members. The three pairs of candidates running for the challenging position of representing the big family of BINUS INTERNATIONAL were Stefani Leoni – Aunindy Esther, Eri Widoera – Eiza, and Arias – Dewangga. After several steps in the selection process, Stefani Leoni – Aunindy Esther came out on top with a very narrow margin over the other candidates, receiving 38% of all votes.